A student interested in a career in the field of criminal justice has many options from which to choose. From police work to law to security, the field is full of varied and interesting career options – and there are as many programs as there are career paths. 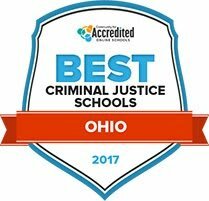 The top criminal justice programs in the state of Ohio are known for their high student success rates and the quality of their staff and curriculum, whether a student is looking for an online school, traditional campus experience or certification programs. After Criminal Justice School in Ohio: What's Next? Whether a student is looking for small class sizes, specific concentrations, or low tuition, this convenient ranking tool makes it simple to compare criminal justice schools in Ohio. By starting the search here, students save themselves the frustration of a prolonged search weeding through websites for admission statistics and costs for various criminal justice programs around the state. Check out the top criminal justice schools and programs for 2017 below. Sinclair College is located in Dayton, Ohio, near downtown. Easily accessible via public transportation, Sinclair awards an Associate of Applied Science Criminal Justice degree. The degree is offered in corrections and law enforcement concentrations. Other criminal justice credentials awarded at Sinclair are a short term and a one year technical certificate. Curriculum outcomes of the associate's degree program teach students about traditional and developing topics like corrections, police department procedures, juvenile court systems, forensics and criminal justice administration. Advanced criminal justice job training focuses on reducing repeat offenses. The school also operates a police training academy. The two year criminal justice degree program at Clark State Community College is a contemporary training program that centers on the corrections component of criminal justice. Upon graduating from the program, students can enter careers in the public and private sector. Jobs that align with courses taught in the program include police officer, youth counselor, probation officer and private investigator. Probation and parole, community relations, social justice and criminal law are classes that are built into the curriculum. It's possible to enroll in on campus, hybrid and fully online classes. Prior work in criminal and civil judicial systems can prepare students for classes in Southern State Community College's two-year criminal justice degree curriculum. Associate degrees are awarded in criminal justice and law enforcement. Both programs are taught during the evening at the college's Fayette campus. It takes 62 credits to graduate with the criminal justice degree. The law enforcement degree is comprised of 65 credits. Areas covered in the programs teach adults about criminal justice systems, crime scene investigation procedures, restorative justice and critical incident management. Applications are accepted online. The main campus of Stark State College is located in North Canton, Ohio. Introduction to the associate's degree in criminal justice starts with adult learners completing a student success seminar. Computer application training is also provided. Program focused classes include criminal justice, ethics, corrections, cultural diversity and criminal procedure. Minimum credits needed are 61. Police science is a more focused criminal justice concentration offered at Stark College. At least 64 credits are needed to graduate with a degree in police science. Currently employee police officers can gain academic credits if they have completed the Ohio Peace Officer Basic Training Academy. Training in policing and justice systems is provided through the Lorain County Community College associate of applied science criminal justice degree. It generally takes two years of full-time study to earn the degree in the police science concentration. Strong math and communications skills are a plus. The school operates on a semester basis. After declaring the criminal justice major, students can expect to take classes in topics like criminal justice investigation, police supervision, personal self-defense and traffic accident investigation. Through its university partnerships, students can continue their education at local universities and earn a bachelor's degree in criminal justice. Students in the Miami University-Oxford Bachelor of Science in Criminal Justice program learn about a range of criminal justice topics, like policing, punishment and corrections, crime and the legal system overall. This comes from a liberal arts understanding, allowing for an integrated knowledge level. Students learn skills like critical thinking, problem solving, communication, technological skills, quantitative literacy and ethics. Students take courses covering direct criminal justice topics like forensic evidence, law and individual rights, criminal behavior and applied research methods in criminal justice. Students learn from four cognate areas: law enforcement, criminal justice administration, corrections and the administration of law and justice. At the University of Akron Main Campus, students can major in political science/criminal justice. Students are prepared to work in homeland security, law enforcement/administration, intelligence and probation or parole. Students can also opt for the advocacy route to serve victims, at-risk individuals and juveniles. Also, students can choose to go into law school or graduate school. Students learn about topics like constitutional law, terrorism, the judicial process and even political scandals. Students also learn from a liberal arts perspective, as they are required to take general education courses like history, art and English. As the name of the program suggests, there are also political science courses like politics in the Middle East and comparative politics. One of the hallmarks of the criminal justice bachelor's program is the hands-on field experience-based resources, where students can work with real-world criminal justice cases. Students work in crime labs, police department's, juvenile probation and correctional institutions, as examples. In addition to real-world skills, the program fosters an understanding of theory base and philosophical underpinnings of the organizations with which they work. Upon graduation, students are prepared to work in a number of law enforcement environments, from the police force to the highway patrol to homeland security. Students are allowed to graduate within the normal bachelor's schedule with a major in criminal justice and a minor, or two majors or multiple minors. The criminal justice program at Xavier University focuses on preparing students for the real world by providing investigative internships, hands-on learning opportunities and student involvement. Students have the opportunity to intern at places like departments of rehabilitation and corrections. In courses, students learn real-world criminal justice skills like blood spatter and hair analysis. There are even hostage negotiation workshops. The school also has a Criminal Justice Society, which sponsors speakers and service activities. In courses, students learn topics like law enforcement, criminology and methods of research in criminal justice. Students are prepared to go into crime scene investigation, law enforcement, rehabilitation or constitutional law. The Bachelor's Degree in Criminal Justice at Tiffin University allows students to choose majors in direct types of criminal justice to better specialize for their goals in the future. Examples include corrections, digital forensics, justice administration and law enforcement. There are also further concentrations students can declare in some majors. Graduates can expect to be prepared to work as law enforcement officers, intelligence and security officers, federal agents and other criminal justice-related careers. Students are also expected to complete an internship as part of the on-campus degree programs. The school also has the Center for Cyber-Defense and Forensics, which helps professionals train, allowing students to interact with professionals and obtain certifications through the center. Finding the right school is as important a decision as the choice to undertake a criminal justice degree. This search tool is a simple and convenient way to compare programs based on the qualities important to you, whether it is class size, tuition cost, student success rates, or other points of interest. Save time and the stress with personalized searches that makes finding what you need in a school easy. Students who hope to make the most of their college experience will also want to keep in mind what careers are available in the local area and what to expect in terms of annual salary. Criminal justice students will find a variety of opportunities in Ohio, dependent on what degree certification level he or she attains. Compare Ohio against the national average for salary, job growth projections and degree requirements to help guide your career as a criminal justice student. Criminal justice careers in Ohio such as a private detective or criminal justice professor are projected to see higher than national average growth, with salaries almost comparable to the national average. Which Ohio Employers are Looking for Criminal Justice Graduates? With potential employers located all over the state, students with a criminal justice degree have a lot of interesting opportunities to go to work serving the local community. Whether you are looking for the hustle and bustle of a city, or would prefer the quiet life patrolling Ohio’s 190,000 wild acres, a criminal justice degree can take you anywhere you want to go. COSE provides small business owners with the tools and resources to keep business growing, and a community of business owners to network with. Through the empowerment of female business owners, the Women’s Business Centers of Ohio provides members with tools to grow their business in sustainable ways, by offering training and other resources both online and on site. The Ohio Business Brokers Association (OBBA) is a non-profit that connects businesses with potential buyers, through the use of a middle party like accountants or real estate agents. The OBBA provides events, information, and other resources. The Ohio Chamber of Commerce champions business development and growth in the state of Ohio. The department helps promote a business-friendly agenda with Ohio government and provides resources to entrepreneurs. The ACC serves corporate law professionals by providing a platform for networking and information-sharing. This government website provides business and community resources for professional growth and development, including a section dedicated to minority interests. The U.S. SBA serves entrepreneurs by providing financing opportunities and resources to guide business expansion. Get information on jobs, training opportunities, news and other resources connected to the Ohio Department of Rehabilitation and Corrections. Apply for grants, network with other correction professionals, or get information about community organizations working to educate the community on corrections issues. CPOF is a national network of correctional officers working together to create a strong community of dedicated professionals. Get information about training opportunities, news, scholarships and many other resources for professionals working in the corrections field. Ohio Community Corrections Association (OCCA) is a community resource to help professionals in the corrections field stay effective at management and rehabilitation. OCCA offers training, news, events and other resources, as well as a network for organizations involved in the corrections process. The Ohio Department of Youth Services webpage is the hub for information about juvenile correctional facilities, parole, community programs and family resources. The OJPC provides advocacy and resources for the purpose improving the criminal justice system in Ohio through policy reform and community education. The Ohio Crime Victim Justice Center provides resources and training opportunities for those who work with crime victims such as law enforcement, victims’ rights advocates, and legal professionals, as well as tools and resources for victims themselves. They provide free legal representation for eligible individuals. The Ohio Association for Justice (OAJ) is a collection of trial lawyers working to provide the best legal representation for all residents in Ohio. The OAJ offers training and events as well as a network of professionals. The Central Ohio Association for Justice (COAJ) works to provide legal service to all citizens, with more than 200 members. The COAJ offers training, events, and other resources for legal professionals in Central Ohio. The National Association of Blacks in Criminal Justice (NABCJ) works to provide fair legal representation and equal justice for minorities in the justice system. The NABCJ also works to recruit minorities for employment in the justice system. Events, training and other resources are available through their website. The OCRA provides membership-based professional networking opportunities and education to court reporters in the state of Ohio. This local chapter of the national CASA organization advocates for the best interests of children who have been neglected or abused. The Paralegal Association of Northwest Ohio serves paralegals in the NW part of the state with scholarships, events, job opportunities and other resources. With the changing pace of technology, it can be difficult to keep up no matter what field you are in. The Cleveland Association of Paralegals, Inc. is dedicated to keeping paralegals professionals up to date with news, information, events, employment openings and other opportunities. The Ohio Association of Criminal Defense Lawyers offers a network for legal professionals around the state, as well as training, scholarships, news, events and other resources. The Ohio Lawyers Assistance Program offers resources for legal professionals struggling with drug and addiction issues. The OSBA is a professional organization for lawyers in Ohio to network and gain continuing education in their field. The Attorney General office exists to serve state employees and agencies in legal representation as well as protect consumers and educate the public. This directory lists a variety of low-income firms that provide legal aid to Ohioans. The OACP is a great resource for law enforcement, providing education, training and employment resources. The OACP prides itself on raising the standards for professionals working as law enforcement in the state of Ohio. Ohio Association of Security and Investigation Services (OASIS) provide members with insurance, training, job opportunities, news and resources for security and private investigators. The Ohio Police Juvenile Officer’s Association provides training and resources for corrections professionals that work with juveniles. They provide a network and other resources to bring professionals together to promote the safe handling of juvenile offenders. This page provides information about the courses covered at the Ohio Peace Officer Training Academy as well as additional law enforcement information. Created to connect and educate Ohio troopers, the Ohio State Troopers Association is a membership-based organization that provides support and resources. The BSSA serves Ohio’s sheriffs by providing resources, information and networking opportunities. Get information on available jobs, training opportunities, community information and other resources from the Ohio Division of Natural Resources. This page has information specifically related to wildlife and natural resource law enforcement. Wildfire investigation and prevention falls under the Ohio Division of Natural Resources’ Division of Forestry. Students looking to work as park rangers can use this resource to look for scholarships, training and networking opportunities. The AONPR promotes stewardship of our natural resources and promotes higher standards for law enforcement. Look for employment opportunities and find out about the 23,000 acres and 18 park reservations that make up the Cleveland Metroparks. Professor Scott Wagner is a 36-year Ohio law enforcement veteran. He began his career in 1980 as a Reserve Deputy Sheriff with the Licking County Sheriff's Office where he worked patrol. Professor Wagner is a nationally recognized author on law enforcement, defensive tactics and firearms related topics who has authored three books and hundreds of articles. He was an academy commander and instructor in the first 27 police academies that were conducted at Columbus State, and also has taught as an adjunct lecturer in the Sociology Department at The Ohio State University for two years. AThey should look for a long-standing history of success in employment. They should also ask about the reputation of the school in question with people working in the field they seek to enter. For example, asking area police officers if they have heard of a local police academy program. AOur program is open enrollment for general students. However, to enter our police academy program, other requirements exist that are mandated by the State of Ohio, like a criminal background check and drug screen. Also, as our academy program is tied to our associate’s degree program, students are generally required to have completed two semesters of work before they can start in the academy. What skills do students need to be successful in a criminal justice degree program? AA willingness to work hard, AND a clear understanding of what kind of things employers require. For example, what kinds of things disqualify someone from working in a law enforcement agency. It is important to know those things before spending a lot of time studying for a career that isn't possible. Students should be people of integrity as that is a critical quality needed in the fields of law, law enforcement, and corrections. What makes the criminal justice profession unique in Ohio? AWe have a system of "free standing" and college academies where those interested in a law enforcement career can go to become certified as a prospective law enforcement officer before being hired by an agency. Once they meet all the state requirements of the Ohio Peace Officer Training Commission, they can apply to hiring agencies. Agencies can then start them right to work in a field training period without having to send them through an accredited academy since that has already been done.